Are your donation pages overcomplicating things with needless information? 2. Actions are highlighted: Required screen touches are clearly marked out in a contrasting color. Side note: Don’t go changing your donation buttons to green. They probably picked green because it can be seen easier in a bright area like an airport. 3. 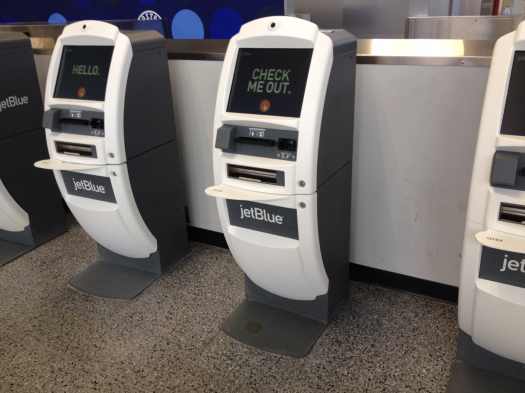 Hurdles are removed: JetBlue makes its check-in process as painless as possible. Customers go from swiping their credit card to getting their boarding passes in just a few screens. 4. Designed for the rule, not the exception: They understand that most of their passengers don’t transport hazardous materials. So on the screen asking whether you’re carrying any, “NO” is highlighted in green. Don’t force people to opt into things unless it makes sense for them or applies to the majority. 5. Timely upsells: Who pays $20 for baggage when you’re buying an airline ticket online? You haven’t packed yet, so you don’t know how many bags you have. And you haven’t carried them 10 minutes from where you parked your car, or got dropped off. Right when you feel the most pain, you’re prompted (at the kiosk) to remove it for $20. Because you’ve entered your credit card to locate your tickets, checking in a bag for $20 is two screen touches. What else can you think of? Tell us below!John Haydon delivers social web strategy solutions for “the quick, the smart, and the slightly manic.” Curious? Then connect up: Contact John by email, see his profile page, visit the John Haydon blog, follow him on Twitter and Google Plus or leave a comment. in this post we are get and like as you are fundraising tips and you can lean by the many of place Many of us detest that check-in method in the international airport. That mixed up flights in addition to delays. By ensuring your own containers connected with curly hair products in addition to products tend to be all if you want. Great tips! Love the comparison between JetBlue and nonprofits – really goes to show how all industries can learn from one another, especially when it comes to marketing done right.